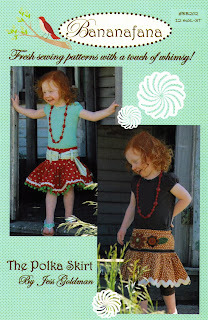 The Polka Skirt will bring hours of twirling fun, for the little one that's wearing it that is. These skirts are sure to turn heads. Everyone loves to dress their little one in something unique and fabulous. This skirt will be customized when you choose your own colors or make it your own signature style by coming up with your own embellishments! Pair these with tees, sweaters, leggings, tights, boots, sandals, or mary janes and let the skirt make it's own fashion statement! Includes patterns for a gathered waist skirt with two different embellishment designs including flower appliques and an adorable belt! Wow! Everything looks great! Your pattern covers look awesome, and your blog too. Congrats on joining blogland! Great job, I love all of the patterns! I made your Lucy skirt pattern, it was really easy and so cute! Can't wait to see what you come up with next! Your site looks great. You are so talented! You have a fresh new look. Wow jess. Your patterns are very unique. they are so whimsical. You should be very proud of your self! All of your hard work and effort paid off and looks great!